Last year, I traveled to Uniontown, Kentucky, where my father and grandfather were born, curious to see the place I had read about in a book, “The Sun Shines Bright,” written by my great-aunt Sue Hamilton Jewell about her life growing up there. I also had photos from an album I collected when my grandparents died that showed the family when my grandfather was a child, a young man, and a father. I wrote a blog about the trip, “My River Kinfolk,” that covered the visit. That simple blog opened up new information I hadn’t expected. I heard from several people who lived in the area, including someone who is distantly related, an author of a book about coal mining in the area, a young woman who lives in Uniontown, a man whose mother purchased the house my family lived in after they had all gone, and a woman who actually lived in the house at one time. I hadn’t expected that kind of response at all. All of that information centered around the lives of my grandfather’s family. Over the next months, I opened a file box that was sitting on a shelf and found another recounting of life in Uniontown from my great-aunt on my grandmother’s side. I was getting more and more of a picture of life on the river in that town. I read about the great Ohio River floods, which devastated the towns along its banks, especially in 1884 and 1937. I started getting more interested in the history of the area. Through another book of the history of the Hamilton family, I traced my grandfather’s family back to Scotland, which they left for Maryland due to religious persecution. The box from my grandmother’s side showed that her family, the Spaldings, left England and landed in Maryland also. Though they didn’t know each other, the Hamiltons and the Spaldings both migrated to eastern Kentucky in 1792, the year it became a state and opened up as the country expanded west. My ties to Kentucky were deepening. And branches of both families ended up in Uniontown, a growing community on the banks of the Ohio with commerce from the river traffic, coal mining, and agriculture. There was even the ubiquitous Kentucky distillery. From what I can tell, my great-great-grandfather on my grandfather’s side was a doctor who ended up in Uniontown. My great-great-grandfather on my grandmother’s side was probably a farmer. They were both part of the growth of the area. My grandfather was born in 1885 and had an idyllic childhood, raised in a large, loving family. His father was a grain dealer with an office at the river for shipping. He was also an insurance salesman for Aetna, so respected that they made him an honorary member of the Aetna family rather than let him retire. He owned a farm in the area, also, which is probably where he was born. He and my great-grandmother were the first couple married in the Episcopal Church in Uniontown and he served as Senior Warden for many years. He was also a charter member of the Masonic Lodge in nearby Morgansfield. They were pillars of the community according to his obituary. My grandmother’s childhood was not quite so charming. One of eight children, her father was a blacksmith and he drank. He was also a farmer, tobacco mostly, and my grandmother picked worms off the tobacco along with her brothers and sisters. Their mother died young and the children took care of each other and all of them worked. Most of them got out as soon as they could. My grandmother’s older sister opened a millinery shop in town and married into another more prosperous family. 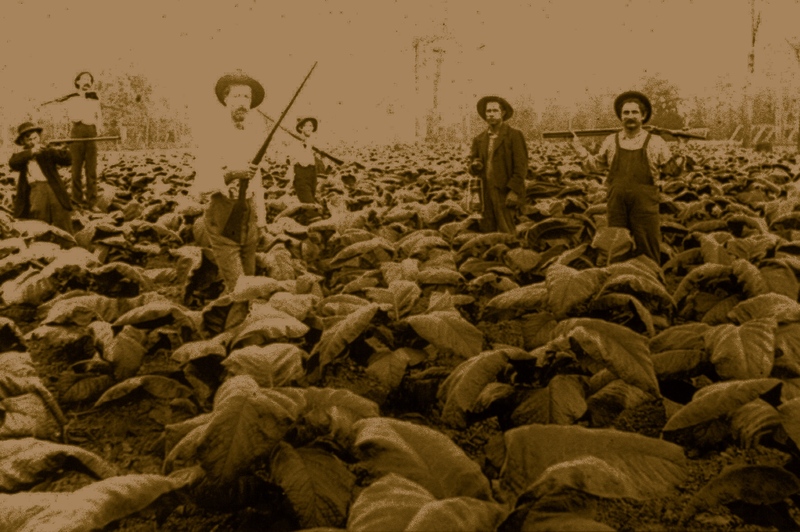 While my grandmother’s family didn’t have the luxury of a camera or a photographer, I have a picture of some of the tobacco farmers, ready to meet the revenuers coming onto their land. One of them could easily be my great-grandfather. 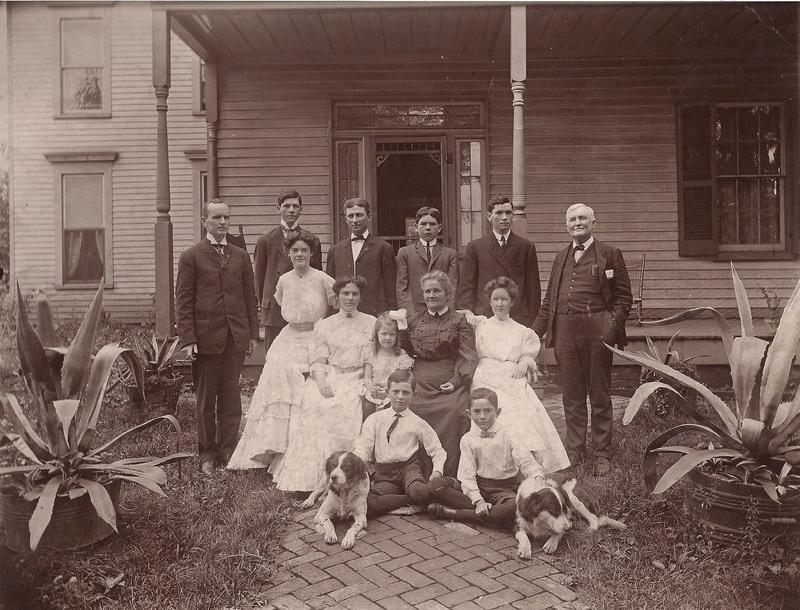 My grandparents married and had their first three children in Uniontown before leaving for other opportunities. 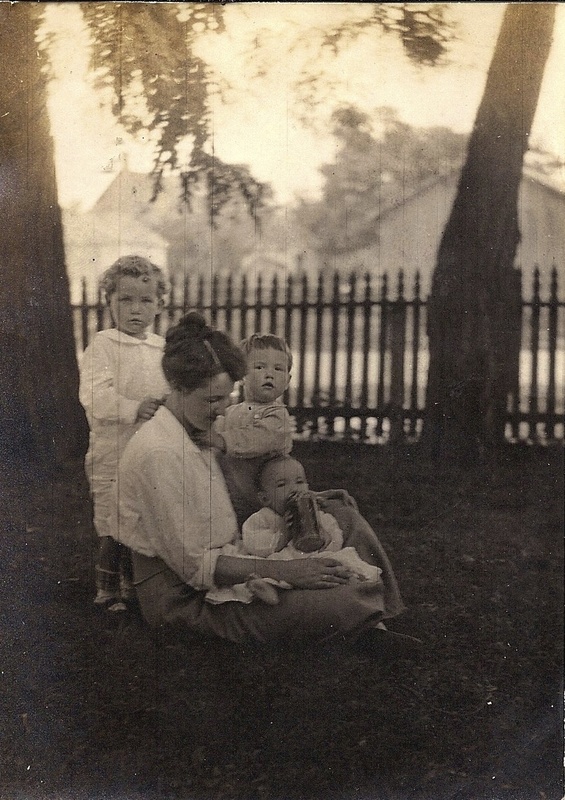 I have these photos of my grandmother with my father (with curls), his brother and sister as babies, sitting on the lawn of the Hamilton house. I note here that my grandfather was Episcopal and my grandmother was Catholic, not such an easy marriage in those days. They were married for 55 years. The story my grandmother told my mother was that they took a trip when they first got married, leaving on a train. My grandfather gave his new bride a fur muff. She was so poor that she didn’t even have underwear and now she had a fur muff. That’s how I heard it, probably close to the truth. 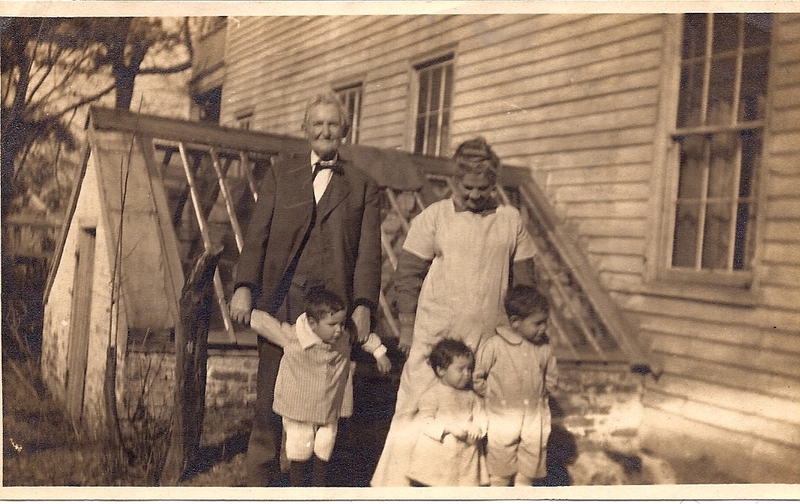 And this photo is of my great-grandparents with their grandchildren, my father on the right. I’m lucky to have many more precious photos. The town was changing as the river changed and the riverboats became more obsolete. 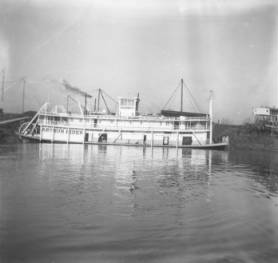 I love this old picture of one of the riverboats that stopped in Uniontown, delighting my grandfather in his childhood. 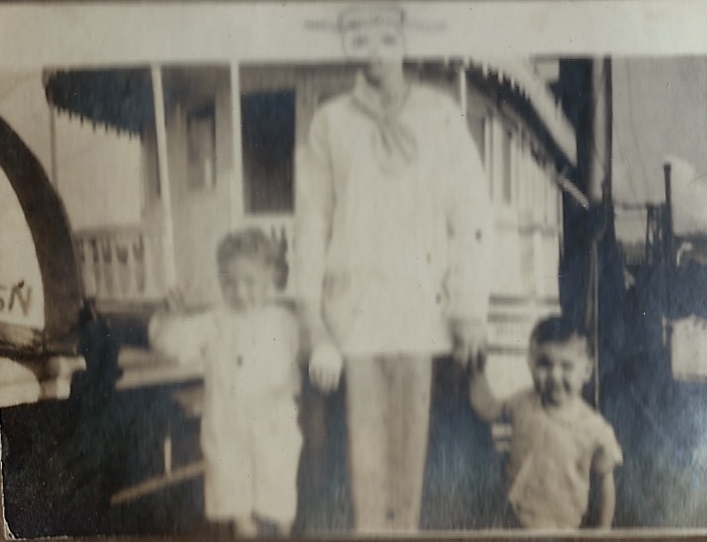 And I realized that this photo of my father and his brother was with a sailor on one of the riverboats. Somebody drew in the head that was cut out of the picture, making it even cuter. Daddy was born in 1912, so this must have been around 1915 or so. 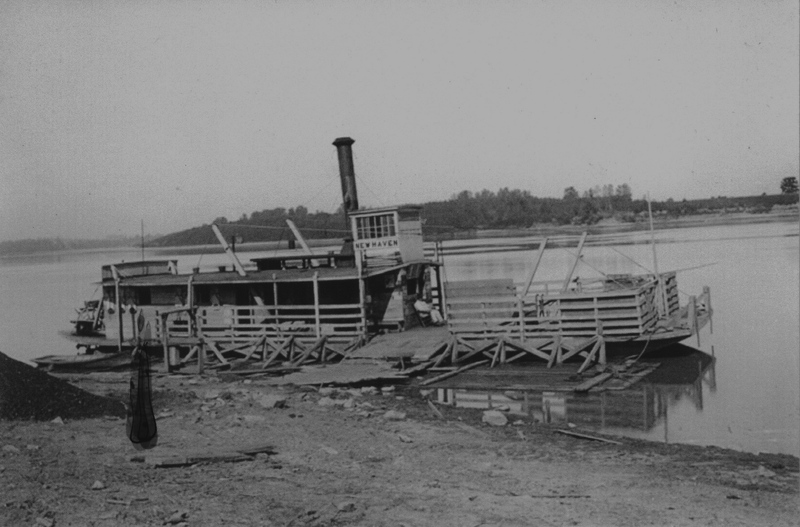 And here’s one of the ferry at Uniontown, one my father probably rode to cross the Ohio. As I found myself with even more information, I decided to return to Uniontown, especially since I now had some people to talk to while I was there. My new friend, Treva Robards, spent a delightful afternoon driving around the area with me, filling my head with stories of her own childhood in Uniontown and pointing out the locations of long gone buildings along with local gossip. I was beginning to get a bigger picture of this area and how it shaped my family. Treva’s interest in my family grew from living in the old Hamilton house when she was younger. The house that held our large family was flooded badly in 1937 and my great-grandmother died soon after from pneumonia contracted because she refused to leave. 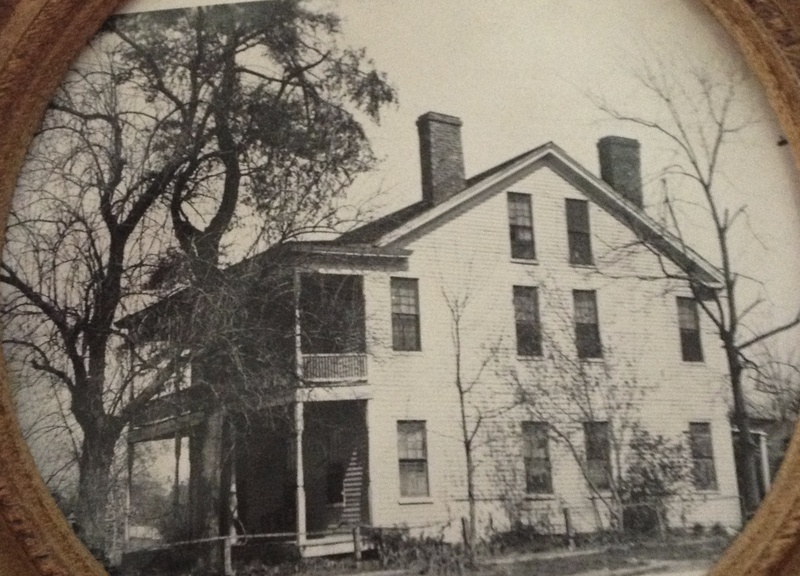 It was purchased years later and became home to two or more families at a time. Treva told me that the house was haunted and she could hear the cries of babies and the clanking of chains every night. We think the cries could be from the three babies who died as infants or toddlers, my grandfather’s siblings. She thinks the chains could be from slaves who were kept in the attic long before my family purchased the house. Those are our theories anyway. I have no doubt she heard them when she lived there. She also told me that she was fascinated by a room that was kept locked upstairs. She would look through the keyhole and see the antique dolls and dress forms with wonderful clothes and trunks piled around. I know these are the things that my great-aunt wrote about in her book that delighted her as a child. The roof fell in, the house was deserted, looters came. Who knows why none of the family came to retrieve those items, some priceless treasures. The family had scattered by then. It gave me an answer to what came next in that wonderful home. 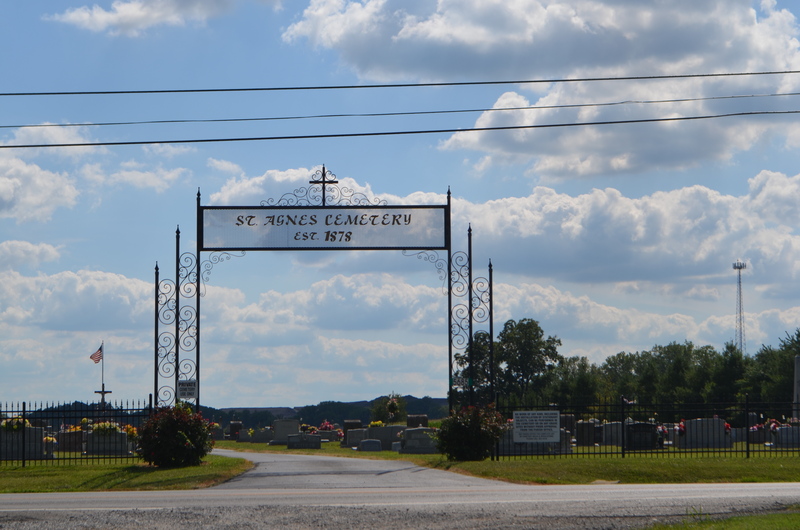 This trip I visited both cemeteries, the Uniontown cemetery where I went last year, and the Catholic cemetery, looking for my grandmother’s family. The Catholic cemetery had lots of Spaldings, but none that matched the names I knew. Many of the headstones were worn bare. I also think my great-grandmother may have been buried in the potter’s field, so I paid my tributes there in the clear area by a pond at the back of the cemetery. 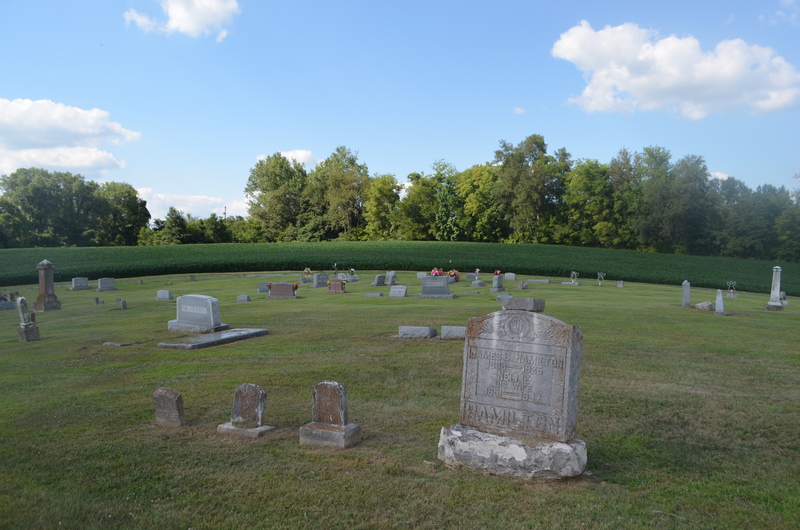 The Hamilton sites were as I left them, although the cemetery was surrounded by corn last year and soybeans this year. There has been so much new information for me to think about this year, so much more to learn about life on the river and how my family was shaped through the centuries. My greatest regret is that I didn’t ask my grandparents and parents to tell me stories of both sides of my family, because now I want to know and find myself searching for more clues. We don’t tell our stories enough because we don’t realize the importance sometimes. I think my childhood was pretty ordinary until I look back and place it in the times. Maybe this is why so many authors tell their stories when they are older. When we’re young, we’re busy looking to the future. When there is less future time left, we turn back to put the past in perspective. I’m glad you’ve been able to dig up as much info as you have. I can’t believe I never asked questions. Thanks for the comments & I hope you discover some treasured stories along the way. My dad was from Uniontown. Ky. He passed away in 2011 and I find myself in the same situation you are in khfraser. I never asked the questions and I am furiously hunting for faint memories. Would love to touch base and compare what you have learned. My family name is Ford and my grandparents owned the Uniontown Grocery Store from the late 50’s through the early 70’s. I am searching for pictures of the store that I remember so well as a child…but have no photo’s of………kford. I’ll check back to see if you see my note. Best of luck in your search! It’s interesting how many people I’ve met with ties to the little town of Uniontown. One lady I met is Treva Robards, who lived there for years and has lots of photos. She’s about 74, so I’m sure she would know your grandparents’ store. She also has relatives living in Uniontown – she lives down the road in Waverly. She’s having surgery either this week or next, but I’m sure she would love to help you. Her email address is sissy42462@yahoo.com – tell her I sent you. I hope she can help you find more information on your family. What a wonderful town it was. Well, better late than never! I am going to reach out to Treva tonight and I hope she is still around. Thank you so much for your reply’s. It’s a year later and I’m still searching for pictures of my grandparents grocery store! Which Ford “cousin” are you? My ancestors (great-grandparents) are Cyrus “Ty” Ford and Minnie Fallis. My grandmother was Grace Belle Ford. I don’t know that I have any Ford cousins. I know Spaldings & Hamiltons in Uniontown. I’ll have to check to see what other names are related. I am from the Ford line, also. Cyrus “Ty” Ford and Minnie Fallis were my great-grandparents. Grace Bell Ford was my grandmother. My name is Kelly Ford, and my grandparents were Jesse and Christine Ford, from Uniontown. They owned the Ford Grocery on 3rd Street, for almost 20 years. My dad was Jesse Ford Jr., and his three sisters, my Aunts, are Norma, Caroline, and Shirley. Wonder if we are related? Treva should be around. I heard from her recently & she was doing fine. Yeah! I wrote her earlier tonight and told her I was referred by you. Thanks so much! I’m trying to find Sue Hamilton Jewell’s book, The Sun Shines Bright,” and am struggling to locate it too. I’ll keep at both efforts though….eventually I’ll get somewhere! I enjoyed reading your story/blog about Uniontown! Thanks for sharing this. My grandmother used to send me $1 when I was in college to get a Pepsi (her favorite) and a hamburger. Thanks for writing! Hi Scotty….this warms my heart! Do you know of anyone that might have any photos of my Grandma Christine’s store? I would do anything to see a picture of it. Thank you! This isn’t Scotty. Maybe on the Union County Facebook page?